Construction toys are popular these days and it’s available for purchase in any toy store, either online or in your local store. These toys are not just trending because they are popular today, but it’s also proven through a well-documented scientific study that children learn faster in their early years if they have allotted a considerable time playing with construction toys. In fact, it’s more beneficial for a modern day child to play with blocks and create things using the various parts available on these toys. The usual things they will learn inherently will include: center of gravity, surface friction, potential energy and several more scientific principles. The most significant areas of play will involve various types of construction toys and this is an important learning experiences for both girls and boys of all ages. Basically, the benefits will last a life time. 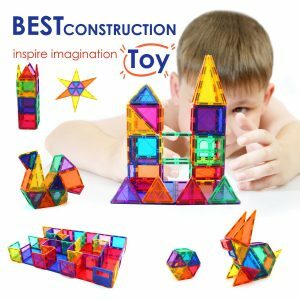 As compared to other types of toys in the market, construction toys offer an opportunity for children to create and design imaginative structures. By using different modular parts, construction toys will open a myriad of ‘what if’ question that challenges your children to continually modify their creation hence improving their character especially their patience. For most adults, it’s quite trivial and a lot of work, but for most children building things through construction toys is not only fun, but it gives them the confidence to overcome both mental and physical challenges. Construction toys can help your child boost their self-confidence and encourage them to learn more. Not to mention this can also develop eye and hand coordination of your toddlers, and it is extremely important for children to develop these motor skills at an early age. There are not so many toys on Amazon that can provide both quality and safety which your kids need. Before buying building blocks and construction toys, you should first do your research and find the one that is best for your kids.